Few horse races capture the spirit of the Grand National. Every winner of this historic National Hunt contest, held annually at Aintree, Liverpool, appreciates the sweet taste of victory is paradoxically mixed with an equal measure of blood, sweat and tears. Stories which lift your spirits, crush your heart, but, somehow, bring a toothless smile to a muddy-face jockey, tired as his mount, weary, but passionate in victory. On Saturday, 9th April 2016 we turn the page of a new chapter to this fascinating race. The most famous of all Grand National winners. He needs little introduction. Red Rum literally made this Steeplechase his own with three outstanding wins in the 1970s. This son of Quorum out of a dam named Mared was bred at Rossenara Stud in Kells, County Kilkenny, Ireland, by Martyn McEnery. Bred to be a Flat racing horse, he dead-heated on his first victory over 5 furlongs at Aintree, in the days before this venue was raced solely for National Hunt. Who would have believed in those formative years he would be ridden by another champion - none other than the legendary Lester Piggott. Those early years were merely stepping stones to a success that few could have foretold. From a 400 guinea yearling purchased in 1966. This bay gelding was purchased by Southport car dealer Ginger McCain for owner Noel Le Mare at a cost of 6000 guineas. Trained on Southport beach, the sight of McCain and his charge captured the determined attitude of man and horse. Only two days after his purchase, Redrum was found to be lame. The sea-water gallops had been akin to an elixir of life for lame carthorses and it proved to be the remedy for a champion that professionals and housewives alike would never forget. 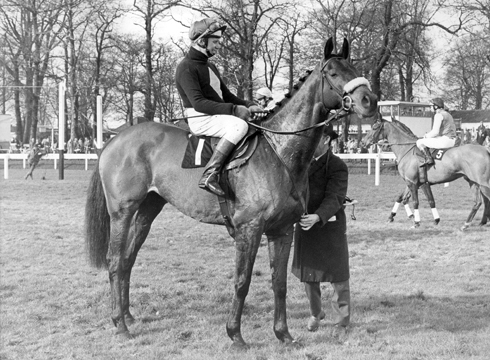 Redrum remains the only horse to win the Grand National three times (1973, 1974 & 1977). Few equine have battled more ardently over 4m 31/2 furlongs, 30 fences and 2 laps. The National is said to be: ''The ultimate test of a horse's courage.'' In a time where jumping fences such as the Chair & Becher's Brook was synonymous with the horse that jumped over the moon he won not once, twice but thrice. Redrum died at the age of 30 making the front page of national papers. Buried at the winning post of his beloved Aintree Racecourse his epitaph reads: ''Respect this place/ this hallowed ground/a legend here/ his rest has found/ his feet would fly/ our spirits soar/ he earned our love forevermore''. Redrum told his own story. He raced 100 times never to fall.